In one of the country’s smallest Jewish communities—in a breathtakingly beautiful area known for its dude ranches and ski slopes—Rabbi Chaim Bruk recruited several men to be part of a worldwide task of learning Moses Maimonides’ landmark compendium of Jewish law, the Mishneh Torah. In fact, the four men—the rabbi and three community members—committed to studying a chapter a day for three years to get through the oral and written Torah, all the mitzvot in detail, along with hundreds of thousands of Jewish men, women and children around the world who also chose to take on this monumental task. This coming Sunday, Dec. 14, this small group of students in an isolated Jewish community will join tens of thousands of Jews around the world who will gather in groups small and large at their synagogues and community centers, as well as online, to celebrate the completion of learning the code and reflecting on its author. People will have the opportunity to participate the “Global Online Siyum HaRambam,” (completion of the Mishneh Torah) which will be broadcast live by Jewish.TV, the multimedia portal of Judaism website Chabad.org, as well, beginning at 8 p.m. Eastern Time. The 13th-century scholar and philosopher’s 14-volume work is the only collection of Jewish law that spans all of Jewish life, including those laws that only apply when the Temple in Jerusalem is standing. When the Rebbe—Rabbi Menachem M. Schneerson, of righteous memory—first called for the near-annual study of Rabbi Moses Maimonides’ foundational 12th-century legal code known as the Mishneh Torah, he stressed the unity achieved by the entire Jewish people studying the same subject in Torah at the same time. 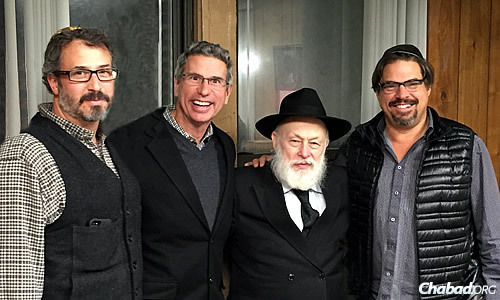 At the recent International Conference of Chabad emissaries in New York: from left, Montana residents Stu Binenstock, Dr. Mick Lifson and Larry Pearson, with Rabbi Yehuda Krinsky, chairman of Merkos L'Inyonei Chinuch, the educational arm of the Chabad-Lubavitch movement. Lifson studied a chapter a day of Mishneh Torah, completing the cycle in three years. The Rebbe suggested three different study tracks: a three-chapter-a-day cycle that completes the 14-volume code in less than a year; a one-chapter cycle that completes the work in just less than three years; and for children and those whose backgrounds are not conducive to rigorous in-depth study, a daily examination of pertinent topics in Sefer Hamitzvot, a companion work of Maimonides’ that lists all of the 613 commandments in the Torah. The emphasis on daily study mirrored the Rambam’s own suggestions on how his work should be learned, but until the Rebbe’s innovation, most people studied the Mishneh Torah piecemeal. This year’s siyum will represent the 11th completion of the Mishneh Torah by those studying a chapter a day, while scholars studying three chapters a day have completed the entire series a total of 33 times since the Rebbe first instituted the study cycle in 1984. Over the years, digital and print resources have sprung up to make the Hebrew-language text readily available. For example, Rabbi Eliyahu Touger’s landmark translation of the entire Mishneh Torah (published by Moznaim) was put online in 2009 by Chabad.org, complementing the existing Hebrew texts and audio classes, and daily emails already offered by the site. Chayenu—a weekly Torah-content magazine—carries the one-chapter-a-day chapters of the week in both Hebrew and English as well. 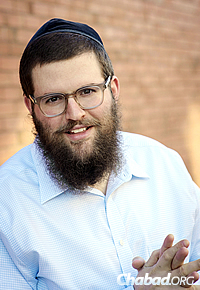 In 2012, Rabbi Joshua B. Gordon began streaming live classes following the one-chapter-a-day track on Jewish.tv, and thousands of students worldwide joined him in that online study. Those archived classes are now available for individuals who will again begin either the one chapter a day or the three-chapters-a-day tracks on Monday. Daily study of Sefer Hamitzvot led by Rabbi Mendel Kaplan is available on Jewish.tv as well. And Malka Touger’s Sefer Hamitzvot for Children can be studied with the kids on JewishKids.org. In addition to recognizing and celebrating the accomplishments of those who have studied over the past year, organizers say the celebrations also serve to attract more people to join the cycle. Rabbi Baruch S. Davidson, who lives in the Crown Heights neighborhood of Brooklyn, N.Y., has been learning one chapter a day with a group of six men for more than four years now. They started in middle of the last cycle, so this is the first full, three-year cycle that they are completing. 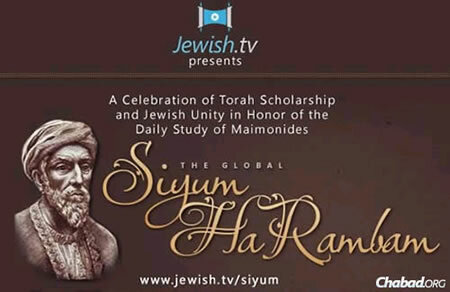 The global Siyum HaRambam will be broadcast live at www.Jewish.tv/siyum. 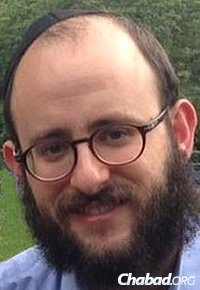 “It takes a real commitment,” adds Davidson, a longtime responder on the “Ask the Rabbi” team at Chabad.org; an associate rabbi at the Beach Minyan of Westhampton Beach, N.Y.; and a regular lecturer at locations throughout the New York area on a host of Jewish topics. As it happens, on most days he also learns the chapter earlier with a phone chavruta, or study partner. Back in Montana, Lifson notes the impact that his three-year daily study of Mishneh Torah has had on his family. Lisfon, along with his wife and son, moved from Baltimore to Montana seven years ago. They were attracted to the area’s outdoor sports, such as horseback riding and skiing. Soon after arriving, they found themselves in search of kosher chicken, which had been readily available on grocery shelves in Baltimore. That’s how he discovered Chabad and Rabbi Bruk, who coordinates a kosher-meat delivery once a quarter via an 18-wheeler semi-truck. Completing the Maimonides cycle, he notes, has propelled him to continue in his Jewish learning, and Lisfon says his family has been increasing their Jewish observance ever since.